Healthy body, healthy mind, healthy life! Celebrate World Health Day on April 7. 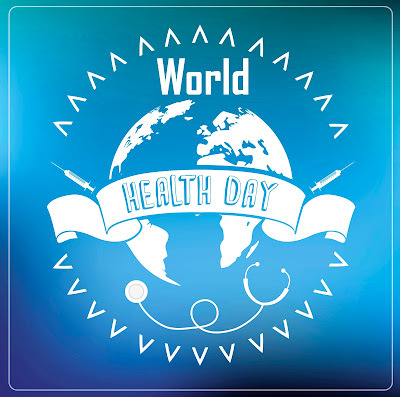 April 7 celebrates the founding day of the World Health Organization (WHO). Its goal is to build a better, healthier future for people all over the world. WHO is an international organization in more than 150 countries that works with governments and other partners to ensure the highest attainable level of health for all people. Here are five easy ways that you can start living a healthier life today! 1. Eat more things that grow. Fruits and veggies are essential to a healthy diet, plus they add some color to your meals. Beige looks good on your favorite sweater, but not your plate (bread, pasta, etc.). 2. Move! Stretch throughout the day, do some cardio, lift weights, maybe even dance a little. Get those exercise endorphins going. 3. Do something that makes you happy. Yoga, reading, painting, synchronized swimming, shower singing - whatever it is that you are passionate about, do more of that. Having a hobby can help you meet new people and cope with stress. Learn more about the benefits of having a hobby here. 4. Catch some Z's. Lack of sleep can negatively affect your level of focus, not to mention you'll get a bad case of the grumpies. According to one article by Harvard Medical School, sleep is vital to learning and retention. Of course it is hard to learn when you are tired, but did you know that when you don't get a good night's sleep after a long day of learning, you won't retain as much of the information? 5. Unplug. Technology is awesome! It's helpful for learning and research, school and work efficiency, getting connected, and much more. It's amazing to have access to seemingly limitless information and entertainment at your fingertips, but it's evident that there are some challenges with technology when it comes to disconnecting. Many of us have trouble disconnecting. When was the last time you turned your phone on airplane mode or OFF completely and didn't feel slightly hesitant beforehand? When was the last time you left your phone at home? If you can't remember the last time you went without technology, check out these expert tips on how to disconnect and get to relaxing by Renne Simpson on Huffington Post. Show us how you're getting healthy for #WorldHealthDay on social by tagging Rio Salado in your posts for this exciting day. Contributed by Shaelyn McCormack, Public Relations Assistant.